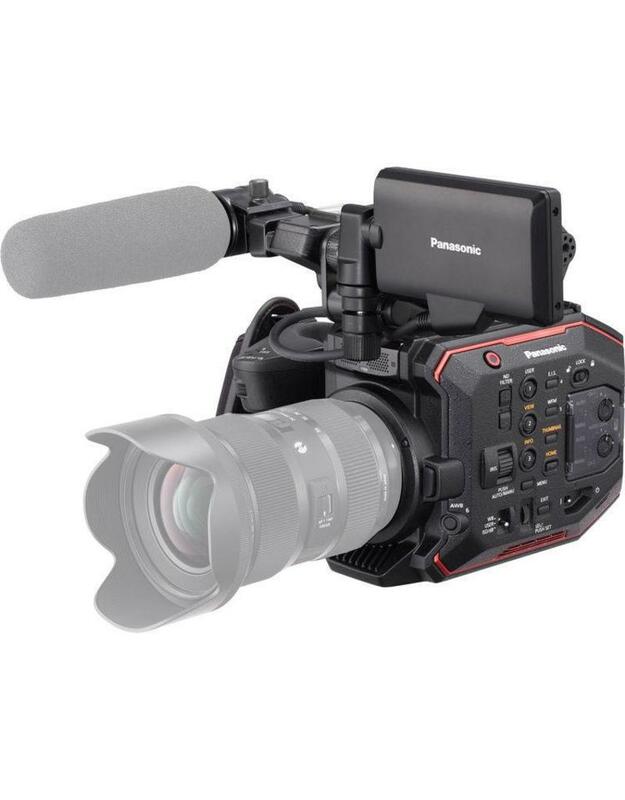 Housing a high-resolution 5.7K image sensor capable of rendering smooth 4K images inside a compact body, Panasonic's AU-EVA1 Compact 5.7K Super 35mm Cinema Camera is a flexible camera system ready for documentary, cinema, and live event production. 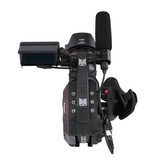 The 5.7K sensor is used to super-sample internal recordings, resulting in higher resolving images with less noise and artifacting when compared to non-super-sampled recordings. 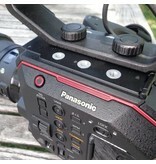 Panasonic's acclaimed Dual Native ISO technology is also incorporated into this sensor. Dual Native ISO uses alternative circuitry within the sensor, rather than adding gain or shifting the gamma of the original signal output, to increase sensitivity while maintaining a high signal-to-noise ratio. 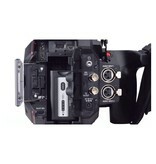 An EF lens mount at the front of the body supports a wide-range of interchangeable lenses from popular manufacturers. 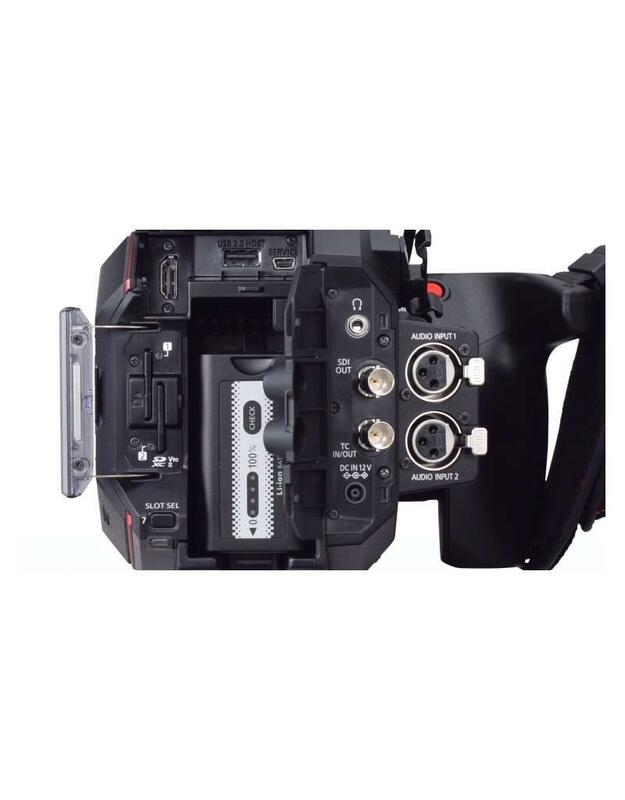 Directly behind the mount is an electronically controlled ND filter wheel offering, 2, 4, and 6 stops of filtration for cutting down on excess light, letting you set your lens's aperture to fit the desired aesthetic of your production. For further flexibility, the IR-cut filter is defeatable for shooting in extreme low-light situations or for creative color effects. On the back-end, videos are recorded using 10-bit, 4:2:2 sampling for smooth gradations in subtle shades and a reduction in banding artifacts over 8-bit sampling. Bit-rates of up to 400 Mbps ensure low compression ratios that will maintain quality through an intensive post-production pipeline required by professional workflows. 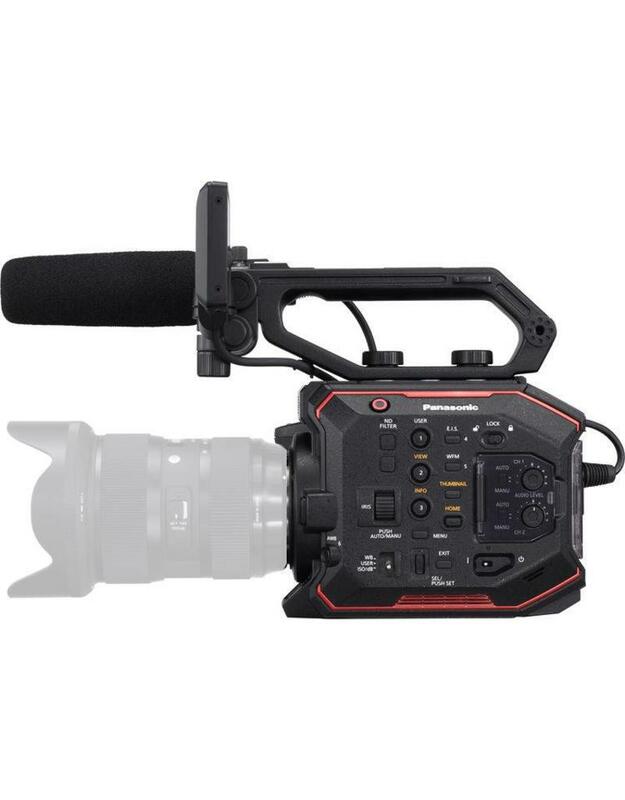 Infusing high-resolution recording into a small form-factor camera body gives DPs and camera operators the flexibility to achieve cinema-grade images in spaces normally restrictive of larger camera systems. 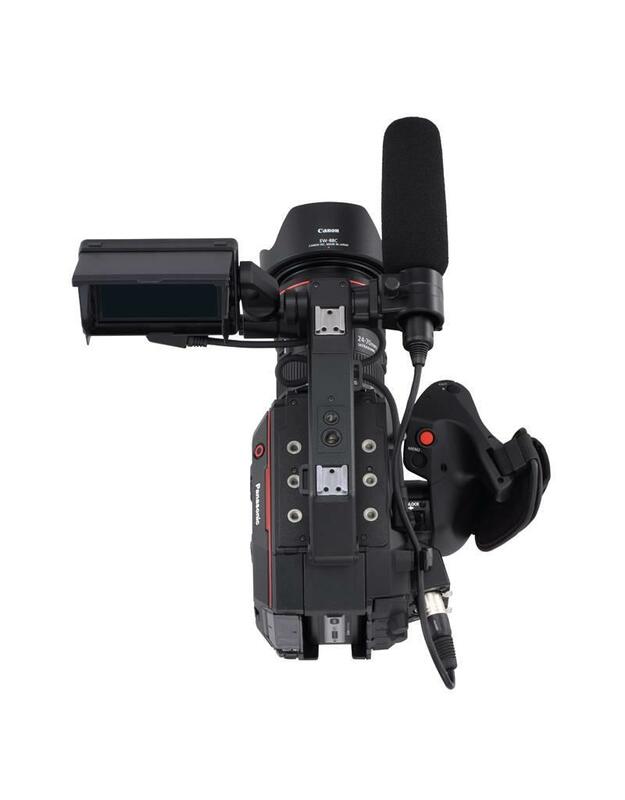 Additionally, since tactile controls and I/O connections are available on the exterior of the camera, the overall design doesn't sacrifice conventional ergonomics for traditional shooting scenarios whether operating handheld or locked down atop a tripod. 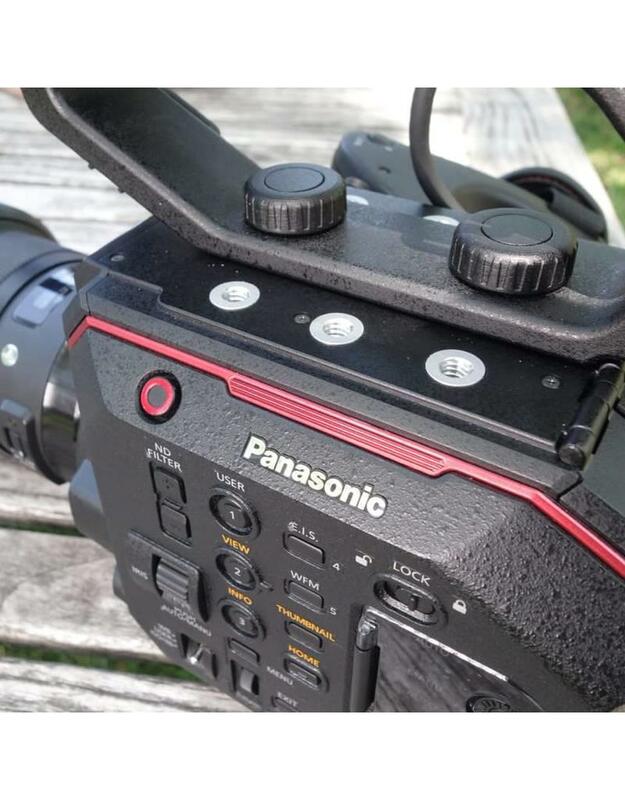 Panasonic's 5.7K sensor is at the heart of this camera. 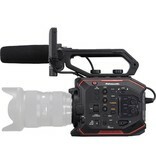 Its high resolution allows for oversampled 4K footage, resulting in sharp images with reduced aliasing and increased color fidelity over native 4K Bayer-pattern sensors. 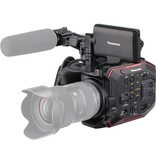 Video is recorded on widely available SD cards, providing high-quality recording on accessible, industry-standard media. * 3 jaar standaard Panasonic fabrieksgarantie met optionele 2 jaar verlenging. Panasonic behoudt zich het recht voor om deze aanbieding op elk gewenst moment in te trekken zonder voorafgaande kennisgeving.